Welcome Village Pizza & BBQ! At the ribbon cutting ceremony on April 18th with new owners Rusty Gault (left) and Joane Shunia-Gault (right). If you are really hungry right now or trying to stick to a diet, you might not want to read any further on this post. Because just look at the deliciousness of this pizza….. Yes, we have a new pizza joint in town and the sauce is a family secret! 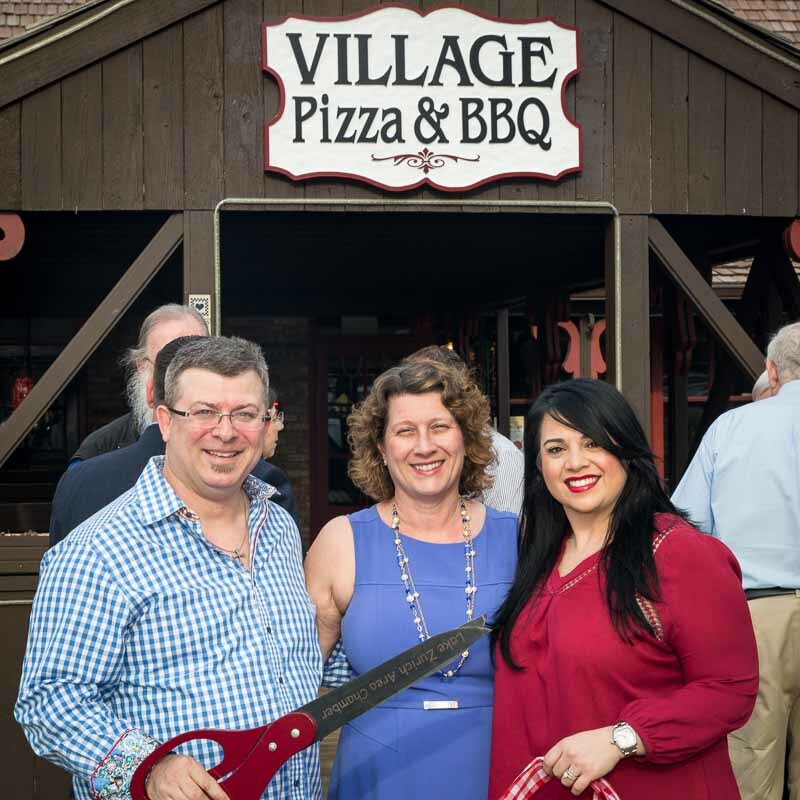 This Monday marked the grand opening and ribbon-cutting of Village Pizza and BBQ, located by the Mill Pond in the former location of Long Grove Cafe. 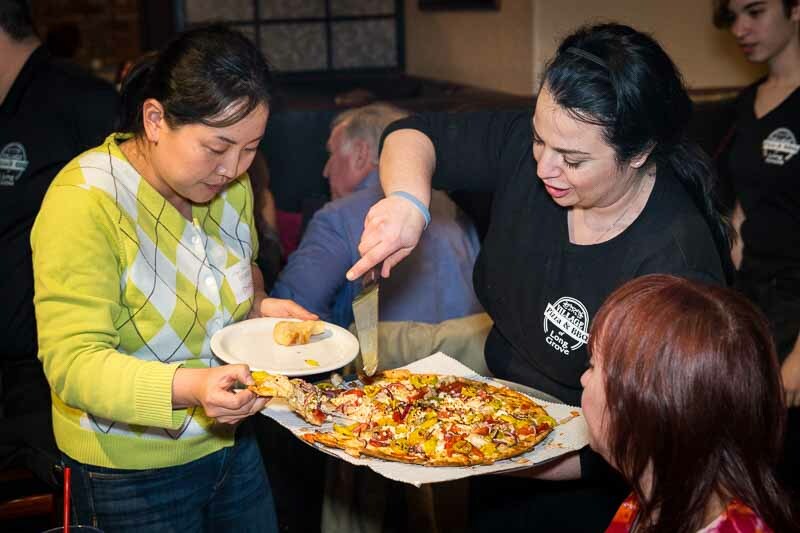 New owners Rusty and Joane Shunia-Gault have relocated from Michigan and brought along their family recipes for thin, hand-tossed, and Sicilian deep-dish pizza. I’ve had the pleasure of trying several different varieties and flavors so far, and each one is better than the next. Since the first of the year, not a week has gone by without a resident asking me when the new pizza place was going to open. 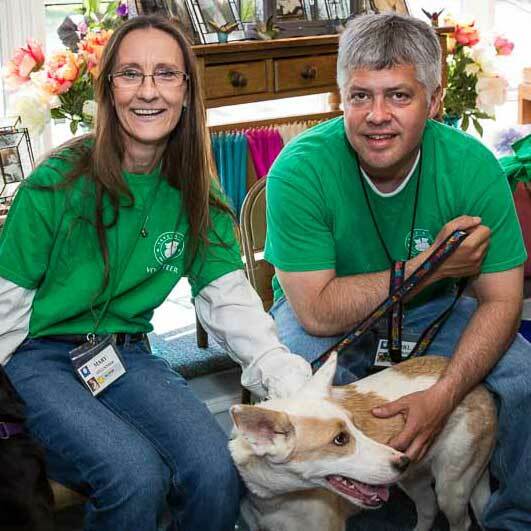 Over the past few months I’ve gotten to know Joane and Rusty and they are a wonderful new addition to our community. 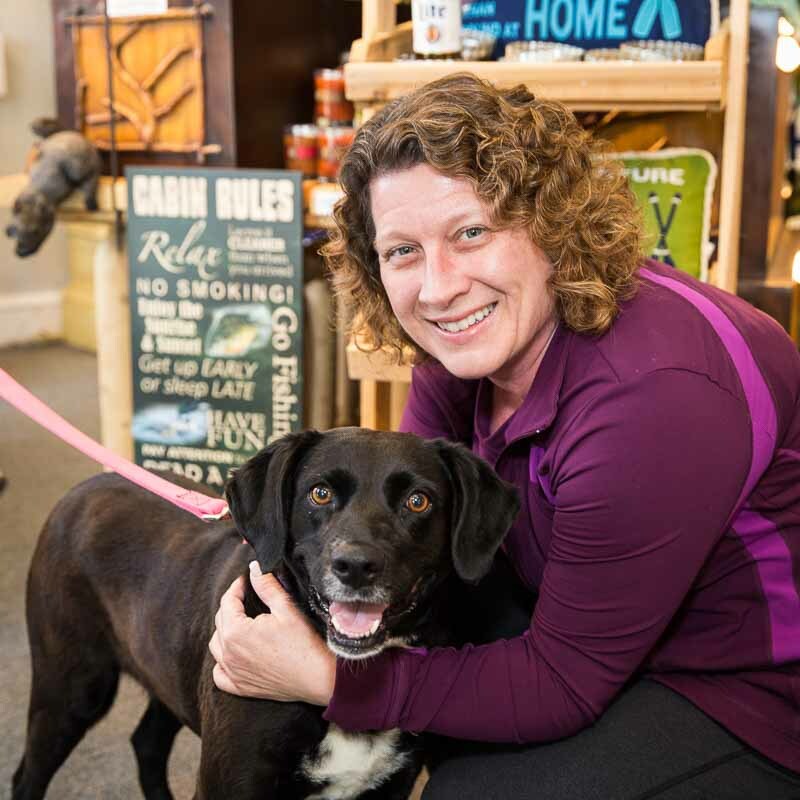 Already they have hosted weekly Rotary Club meetings, Chamber of Commerce Mixers, and a get-acquainted gathering for residents hosted by Long Grove Living magazine. The pizza is getting rave reviews and we all wish the best of success for our newest downtown business. Welcome!! Joane serves up a slice for an eager resident at a gathering Tuesday evening. Enjoying High Tea with Buffalo Grove Village President Beverly Sussman (4th from left) and area Girl Scout leaders on April 14th. As a female in the predominantly male field of politics, I think it is important to do what we can as women and mothers to encourage leadership in young women. My neighbor and colleague Beverly Sussman, Village President of Buffalo Grove shares this sentiment, and recently the two of us teamed up to host a Leadership Tea for local Girl Scouts. Last Thursday, fifteen girls from Long Grove, Buffalo Grove, and Arlington Heights joined us at Gerri’s Tea Room in Long Grove to enjoy a three course High Tea complete with finger sandwiches, pastries, and freshly baked scones with cream. As we were supping on our English Breakfast & Earl Grey blend, Gerri (who grew up in Ireland) provided us with some history on teatime customs and etiquette. As we learned, the tradition of sharing tea is really more about the conversation than the food (although those scones were scrumptious!) To that end, Beverly and I engaged the girls in some conversation about our jobs as Village Presidents, and how our different leadership roles throughout life have lead us to the positions that we now hold. We talked about how women have unique contributions to make to this world, and encouraged the girls to rely on those strengths, say yes to opportunities in life, and not be afraid to “reach for the stars.” The idea was to enjoy a relaxing ladies afternoon together and hopefully provide some inspiration for the future. 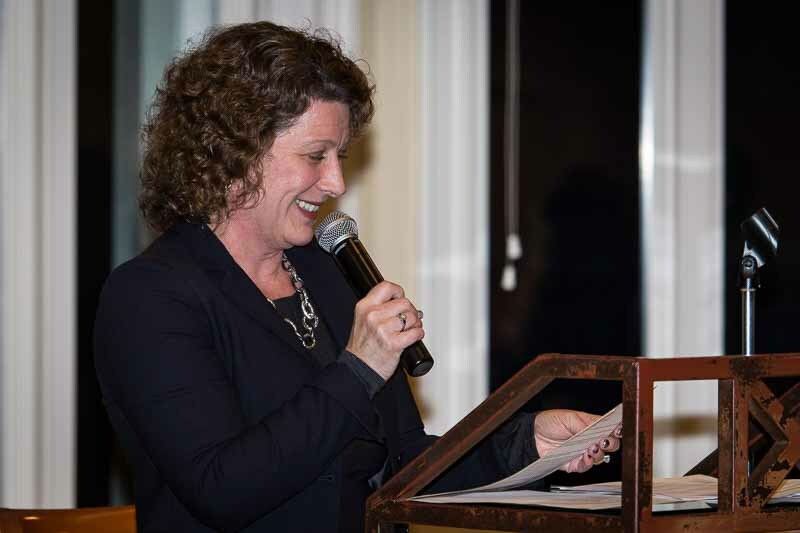 The Girl Scouts of Greater Chicago and Northwest Indiana also blogged about this event. Click here to read more. Gerri Gwarnicki (in green dress at right) explains the proper way to drink from a china tea cup. Making my opinion known at a recent Village meeting. Long Grove is no different than any other municipality in our desire to make decisions that are in the best interests of the majority of our residents. And like other municipalities, we tend to see and hear from the same group of familiar faces at each and every Village Board meeting. While we sincerely appreciate the dedication and personal commitment of these individuals, it is not realistic to believe that the same handful of residents are consistently speaking for the other 8,000 members of our community. Today, the Village launched a new online tool that we hope will make it easier for the majority of our residents to become more engaged with the Village Board. Peak Democracy is a non-partisan company with the mission of broadening civic engagement and building public trust in government. We have utilized their software to create an online forum in which all residents can weigh in on important current issues and post statements, which Village officials can read and consider as part of the decision making process. From time to time the Village will post topics for input over a specific period of time. Residents who participate can also have the ability to see what others are saying in the discussion. We are hopeful that this additional way of getting feedback from the residents will enable more community members to participate in the democratic process. Please join in on our first topic, which is a short survey asking for your thoughts on our current Village of Long Grove communications and outreach efforts. Click here ( http://www.longgrove.net/content/open-village-hall ) to go directly to the Open Town Hall site and complete the brief one-time registration. You will be asked to provide your name and address so that users and officials can know if statements are made from Long Grove residents. The current survey can be completed without your responses being publicly linked to your name. Peak Democracy has strict provisions in regards to confidentiality. I hope many readers of this blog will join in the conversation. It would be a wonderful thing to see more of our residents making their opinions known about what is happening in our Village. I realize that in today’s world the demands on all of us are great. Many of the members of our community lack the time or ability to physically attend our Village Board meetings. Yet so many of you truly care about civic matters and the direction our elected officials take on important issues. We want to hear from you! Happening upon a potential crime scene on my way to official mayoral duties. Something very strange has happened here in Long Grove. It is a mystery without an answer. I am writing about this today, in hopes that one of my blog readers will be able to provide the Village with some insight into what really occurred. The Crime Scene: Archer parking lot, on a beautiful Saturday morning following Apple Fest. In town to participate in a ceremonial ribbon cutting for a new business, I happened on a scene of utter destruction. 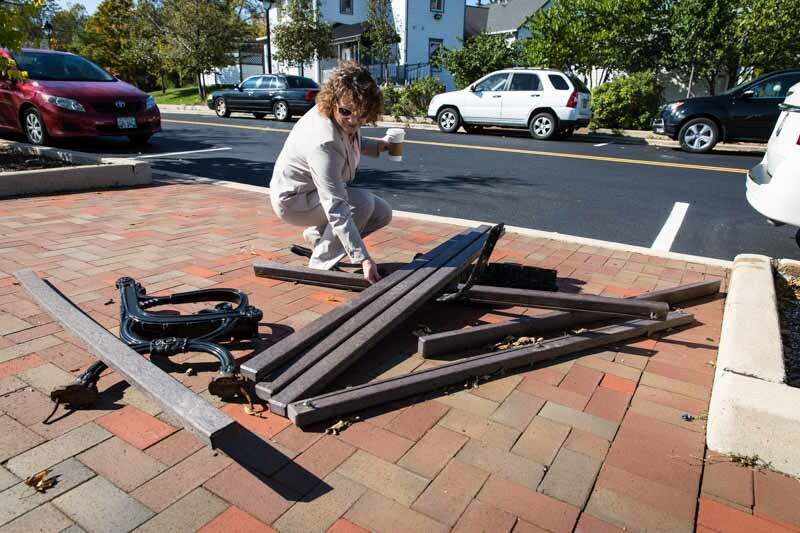 One of our municipal park benches had been totally dismantled; yanked out of the brick foundation by an unseen force. Was it local vandals or something more sinister? We just don’t know. The Evidence: Twisted metal spikes and wooden bench slats laying askew. I did notice a slight lingering odor of cotton candy, and traces of rainbow colored fur caught on the rough edges of some boards. In addition, strange hoof prints were noticed in the adjacent landscape beds. Upon closer inspection, animal droppings of a curious sort were present, dusted with a glittery sparkle. Unicorns? Samples were gathered and sent to the lab for analysis. On my way back to the car I passed by the scene again and took another closer look. It was then that I discovered several crushed and limp shamrocks littering the crime scene, and an empty, cracked “pot o’gold” discarded off to one side of the parking lot. Could leprechauns be the culprit here? I contacted the Lake County Sheriff to file an unusual incident report. First thing Monday morning our crack investigative team from the Ela Township road crew arrived to stabilize the situation. Potential alien DNA was spotted and reported to the authorities. Still, no definitive answers. The bench was reassembled and now seems to be giving off lesser amounts of radiation. The Conclusion: We haven’t got a clue. And if this seems a bit far fetched, April Fools! But we still have no idea what really happened to our bench.